In the 1600s musicians sometimes used sticks, large staffs, or their hands to keep time. Often the principal violinist kept an ensemble together. The harpsichord player could also be in control of tempo. Over time the principal violinist began to use the bow away from the instrument to conduct. The orchestra grew much bigger from 1600-1800 and needed more help working as a group. Conducting with a baton as we know it emerged in the 1800s. The conductor evolved from a time keeper to the interpreter of music that we know today. Very common division. Much of the music on the radio is grouped in 4. Listen to the following music with your eyes closed. Is the music grouped in 2, 3 or 4? Need a hint? Open your eyes and watch the video. See if you can identify the pattern shown by the conductor. Maurice Ravel’s Bolero is written in a 3/4 time signature. This means that there are three quarter notes in each measure. Listen for the repeating 6 beat phrase in the snare drum. It never stops throughout the entire piece! This selection is Lisa Nickl performing the conclusion of Bizet’s Carmen Fantasy which is in 2/4. It is based on Georges Bizet’s famous opera Carmen and features several different tempos all in groupings of two. 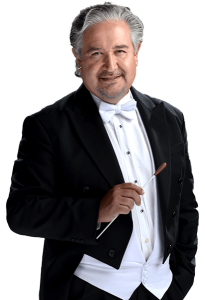 See if you can find the fermata in the music by watching Maestro Guzman’s baton. When does it hold still? Do you hear the music hold as well? This example is Ania Bard-Schwartz performing Tango by John Williams. A tango is an Argentinian dance in groupings of 4. The tempo of this selection is relatively stable until the end. Can you see the point when Maestro Guzman stops and follows Ania for the ending? Following a soloist is also a very important part of conducting! The conductor definitely has the least expensive instrument in the orchestra. A baton can cost around $25, but other orchestral instruments start in the thousands and go up to millions of dollars! The French Baroque conductor Jean Baptiste Lully used a large staff to keep time. He accidentally crushed his foot while conducting and died as a result of the injury!! Who would of thought conducting was dangerous? In 2007 Marin Alsop became the first woman to be the conductor of a major orchestra in the United States. Our own Maestro Hector Guzman loves movies, and of course, their musical scores! !